Korean food is wonderful, and in my opinion, under-appreciated. When I lived in Sao Paulo, I loved a restaurant that specialized in Korean barbecue, a gastronomic experience not to be missed. Unfortunately, our current location is less blessed with good restaurants, and Korean food is nowhere to be found. The only way to satisfy my cravings is to cook it at home! I’ve made this dish many times since it was first published in Fine Cooking, and it’s become one of our favorites. Trim the pork of any silverskin and excess fat, and cut on the diagonal into 1/2-inch-thick medallions. Pound each slice gently with a meat mallet, protecting it with plastic wrap as you pound it. In a small measuring cup, whisk together the soy sauce, 2 Tbs. of the rice vinegar, 2 Tbs. of the brown sugar, the garlic, ginger, 1/2 Tbs. of the sesame oil, and 2 tsp. of the chile sauce. Toss 1/2 cup of this mixture with the pork medallions in a large bowl; reserve the remaining mixture to use as a sauce, if you want. Let the pork sit at room temperature for 25 minutes or refrigerate for up to 12 hours. Heat 2 Tbs. of the canola oil in a 12-inch, heavy-based skillet over medium high heat until very hot. Remove the pork from the marinade, shaking off the excess, and transfer the pork to a clean plate. Discard the marinade. Add half of the pork medallions to the skillet, spacing them evenly. Cook them without touching until well browned, about 2 minutes. Flip and cook until the pork is just cooked through about 2 more minutes. Set the pork on top of the slaw. Pour out the oil and wipe the pan with paper towels (if the drippings on the bottom of the pan look like they may burn, wash the pan). Return the pan to medium-high heat. Add the remaining 2 Tbs. canola oil, and cook the remaining medallions in the same manner. 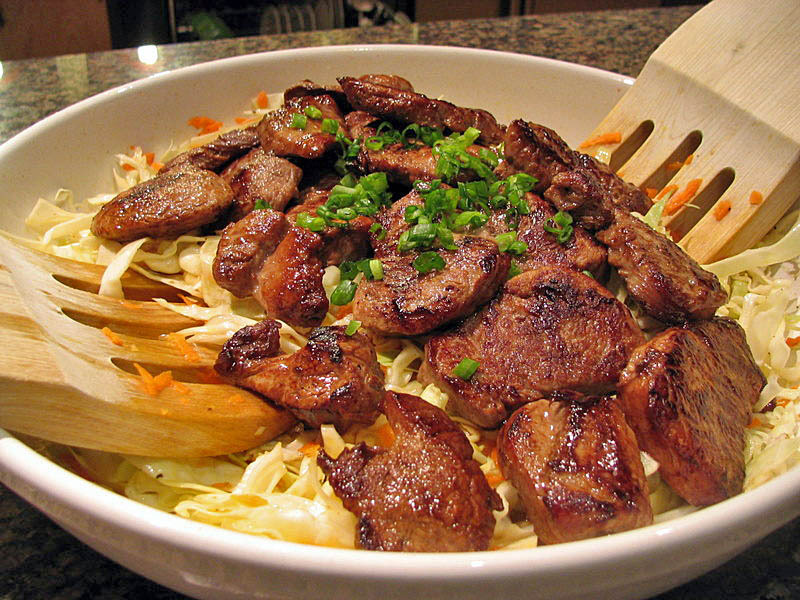 Top the slaw with the remaining pork, and pour the reserved soy-ginger sauce over the medallions. Serve immediately, sprinkled with the remaining scallions. Instead of adding the reserved marinade on top of the meat, I advise you to try a little on your plate – some people might find it too strong. I often skip the additional sauce, particularly when the meat was marinated for several hours. Corte os lombinhos em fatias diagonais de 2 cm. Proteja cada fatia com filme plastico e bata suavemente com um batedor de carne para obter fatias de espessura homogenea e um pouco mais finas (cerca de 1 cm de espessura). Misture o molho de soja, 2 Tbs. do vinagre de arroz, 2 Tbs. do açúcar mascavo, o alho, gengibre, 1 / 2 Tbs. do óleo de gergelim, e 2 tsp. do molho de pimenta. Coloque as fatias de carne em uma tigela e adicione metade desse molho, deixando a carne marinar por 2 a 12 horas. Reserve o restante para servir com a carne. novamente e coloque numa tigela para servir. Aqueca 2 colheres de sopa de oleo de amendoim em uma frigideira grande, ate’ que comece a mostrar sinais de fumaca. Retire a carne do molho de soja, deixando escorrer todo o excesso. Adicione metade das fatias na frigideira e cozinhe cerca de 2 minutos por lado. Adicione os pedacos de carne sobre a salada. Limpe a frigideira, se necessario, adicione mais 2 colheres de sopa de oleo e frite o resto da carne. Sirva imediatamente, com o molho de soja reservado, e salpique com a cebolinha. I’ve been trying to learn more about Korean cuisine, and this sounds like a great dish. The slaw sounds fresh and lovely. Thanks so much, Barb! Hope you will enjoy the recipe! mmm… that made me hungry all the sudden.